The Miami Dolphins hosted the Atlanta Falcons, with no action from newly-signed QB Jay Cutler, the Dolphins bettered the reigning NFC Champions by a score of 23-20, highlighted by a 99-yard touchdown from QB David Fales to WR Damore’ea Stringfellow. With that, we refocus on this contest and give you our PFF exclusive takeaways from the contest for each team. It was a good day for the undrafted free agent out of Virginia, who played the second most snaps among all Dolphins offensive players (55 snaps). He allowed just one late QB hurry on 35 pass blocking snaps for a pass blocking efficiency of 97.5, tops of any tackle so far this preseason with at least 23 snaps in pass protection. He also finished with an impressive run blocking grade of 85.3. It was impressive to see Owusu with such a high grade considering he only had two catches all game. But both catches were on throws over 20 yards in the air, which means Owusu had a perfect 100.0 percent catch rate on deep throws. Both catches were impressive back shoulder catches on third down, one of which went for a touchdown, which only added to Owusu’s impressive performance. The former seventh-round draft pick played just 16 snaps but made his presence felt, generating a hit and a hurry on just six pass-rushes, for a pass rush productivity of 25.0. Fede also made two combined defensive stops, and finished the game with team-high overall grade of 85.5. Okoye was disruptive in both the run and pass game, collecting two quarterback hurries, two tackles, and two solo stops on the night. The third-year pro was one of the lone bright spots for the Falcons offense as Ward ended up with a game-high 48 yards on 11 carries and a touchdown. That translated over to another game-high, as his 75.3 run grade topped all backs. While the rest of his teammates combined to allow 11 quarterback pressures against the Dolphins, Averill held his own in not allowing a single pressure on 16 pass blocking snaps, for a pass block efficiency of 100.0. His pass block grade of 79.0 was the best of any Falcons player. 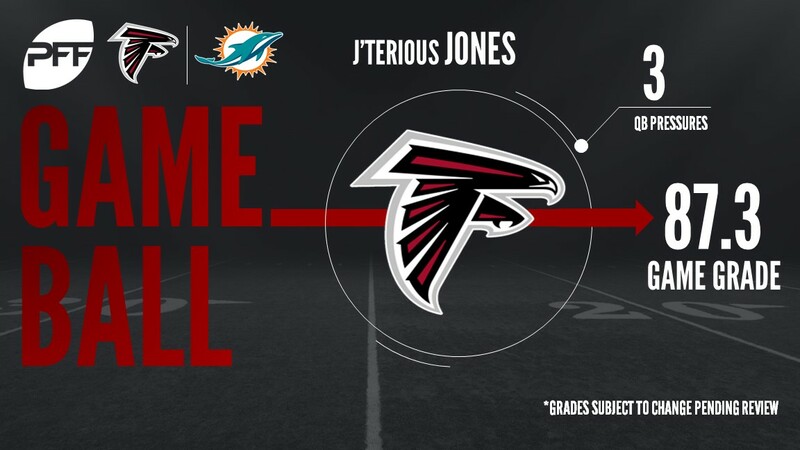 Jones was making plays all over the field for the Falcons defense on Thursday night. He finished with a pass-rush productivity mark of 10.7 thanks to his one QB hit and two hurries (plus two more negated by penalties) on 21 rushes. He also added a pass defense on one of the few plays he dropped into coverage. Vellano was a force in the run game for the Falcons defense, racking up four solo run stops on just 14 run snaps. That works out to an incredible run stop percentage of 28.6 percent. He also chipped in with a pressure and forced an offensive holding penalty on another pass-rush, leading to his impressive grade.